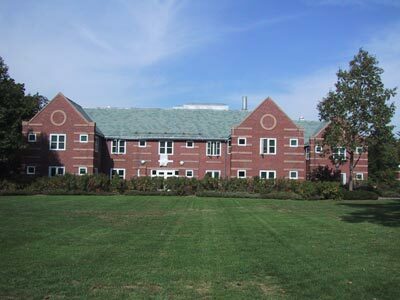 Ten years after its construction, this dormitory is still referred to as "New Dorm," and it is still the most recently constructed dormitory on campus. The dorm is home to seniors, and is located in the midst of the old fraternity row, between Hamilton and Drew Houses. (Photos taken 12 October 2001). Construction on New Dorm began in the summer of 1985. The rooms were designed as large singles intended for use by thesis-writing seniors. The building was designed by Architectural Resources Cambridge, and they received a citation from the Boston Society of Architecture for the design. 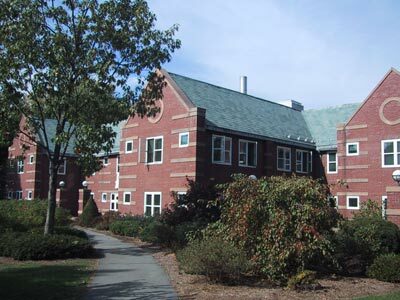 The dorm was completed in the summer of 1986. On October 14, 1989, New Dorm officially became Donald S. Cohan ('51) Dormitory. (Archives & Special Collections, Buildings & Grounds Collection, box 18, folder 21).